december 9, 2005 Johan KänngårdComments are off for this post. 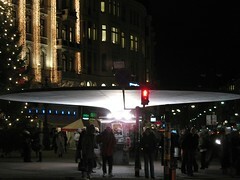 This construction can be found at the heart of Stockholm at Stureplan, and is often used as a meeting place, since it is hard to miss. Vem vill ha datorn på när man ringer?